The booklet “10x10. 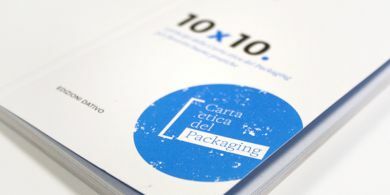 I principi della Carta etica del packaging per favorire buone pratiche” (The principles of The Etichal Packaging Charter to promote good practices) edited by Valeria Bucchetti and published by Edizioni Dativo contains the projects realized during the Workshop held in May 2017 at the Politecnico di Milano, School of Design (Master of Science in Communication Design). With these projects, the students took part in Packplay 2, an initiative by École de design of UQAM and by Éco Entreprises Québec. Each group has set the principles expressed by “The Etichal Packaging Charter” (responsible, balanced, safe, accessible, transparent, informative, up-to-date, forward-looking, educative, sustainable) as key-points from which to direct the project activity.